The true story of cult murder in the American Heartland. On a peaceful August morning in 1985, grim-faced FBI agents led a dawn raid on an eighty acre farm outside Rulo, Nebraska, said to be occupied by a group of religious survivalists led by the charismatic Mike Ryan. What they found on the farm shocked even experienced investigators. Their investigation would uncover what had been a truly Evil Harvest. For months Ryan's Nebraska neighbors spoke in whispers of gunfire in the night, the disappearance of women and children, neo-Nazis and white supremacists. But little did the locals know what was happening to those Mike Ryan decided to punish for their "sin." 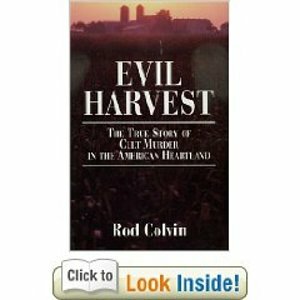 In Evil Harvest, the author re-creates a chilling story of torture, hate, and perversion, and how good, ordinary people could be pulled into a destructive, religious cult - a cult that committed unthinkable acts... all in the name of God. This book contains 8 pages of photos.